Photo by Alan Tahler / Freshman Chris Bolden pulls up for a three pointer. Bolden was a combined 4-8 from three point distance against Wake Forest and Clemson. The Jackets were clicking on all cylinders Saturday, Jan. 26, as Tech completed its romp of Wake Forest 82-62 in front of 8,180 fans in Hank McCamish Pavilion. The Jackets, who led by as many as 30 points, were led in scoring by freshman forward Robert Carter Jr., who had 20 points. Carter shot accurately and often, finishing the day shooting 9-10 from the floor, including a 2-3 performance from long range. Tech got out to a fast start after winning the tip. Senior guard Mfon Udofia connected with freshman guard Chris Bolden on the baseline who drilled a three-point basket as soon as his hands touched the ball. After just five seconds of play, Tech had secured the lead permanently. Bolden returned the favor on the next possession after grabbing a steal and finding Udofia outside of the arc for another quick three-point basket. Despite getting in foul trouble, Bolden finished with nine points and three assists on the day. Wake Forest did not record its first field goal until the 16:10 mark, but it was too little too late as the Jackets had already scored 16. 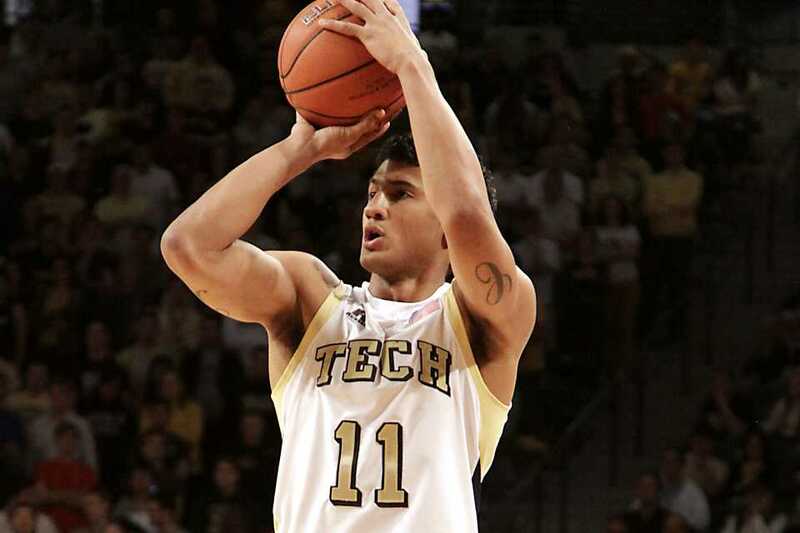 Tech continued to extend its lead, but a late first half surge by the Demon Deacons made the score 52-29 at the half. As the second half begun, the crowd grew antsy as Tech went scoreless through nearly the first five minutes. Wake pulled to within 18 before the Jackets regained their composure on offense with a 10-4 run, in which redshirt-junior guard Brandon Reed had five points and an assist, to make the score 64-40. The Jackets maintained their lead for the rest of the game and secured their first conference win with a final score of 82-62. The Jackets headed to Clemson the following Tuesday, searching for their second straight win and their first conference road win since Jan. 2012. Tech got off to another fast start, with Bolden hitting two threes early to put Tech up 6-0. The Jackets appeared to be dominant for most of the first half except for the final five minutes, during which the Jackets did not record a single point and turned the ball over three times. Clemson extended its lead during the first 10 minutes of the second half, but the Jackets fought back strong. The scoring tandem of redshirt-junior center Daniel Miller, Reed, and freshman guard Marcus Georges-Hunt pulled the Jackets to within five with under a minute left. The drama continued down to the final seconds. A Udofia free throw made the lead 61-60 for the Tigers with 17 seconds left. However, after a quick foul, Clemson pushed the lead to 63-60 and time expired on Tech as a last-second three by Reed missed to the right. Miller finished the day with 16 points and four rebounds. Redshirt-junior forward Kammeon Holsey added 14 points and four rebounds and continued to perform well off the bench. Tech will come back home to take on the University of Virginia on Sunday, Feb. 3.